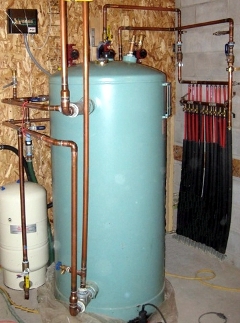 The buffer tank is used with a hydronic heating system. It sits between the load-side water coil of the water-to-water geothermal heat pump, and the hydronic heat distribution piping. Water circulates from the tank into the geothermal heat pump, where it is heated or cooled, and then back to the tank. The buffer tank's thermostat directly controls the operation of the geothermal heat pump, so that the tank will always have plenty of water for the zones to heat or cool with. Upon a call for heating or cooling from any zone's thermostat, water circulates from the tank, to the zone(s). Buffer tanks are used in hydronic heating systems to even out the temperature, and the flow rate, of the hydronic system fluid going into the geothermal heat pump. This is important because any extremes of temperatures or flow rate through the heat exchanger coil will cause inefficiency of operation or total shut-down of the geothermal heat pump (for protection from high refrigerant pressures). Buffer tanks also help to prevent short cycling, by providing a larger thermal mass that avoids triggering the thermostat to start and stop the geothermal heat pump too often. A buffer tank mixes the water coming back from all the zones that are circulating at any time, so more even-temperatured water will enter the geothermal heat pump's coil. If there are wide temperature fluctuations in the water entering the coil, then the refrigerant in the geothermal heat pump will flow erratically, causing much lower efficiency. If the temperature fluctuations get too large, it could cause the geothermal heat pump to think there is a problem, and shut down and advise you to call for a service technician. Usually there are a number of zones for a hydronic heating system, and any number of zones may be circulating at a time. Water flow problems can happen when there are only one, or two zones open, on a system with many zones. If the system does not have a buffer tank installed, the water flow though the water coil will be too slow when only one or two zones are open, and the geothermal heat pump will shut down. With a buffer tank installed, no matter how many or few zones are circulating, the water flow through the geothermal heat pump's water coil will always be the same.